There are very few companies plying their trade at the ultra high end of the audio spectrum, and one of the better known of these is Britains Audio Note. Audiophiles willing to spend a quarter of a million dollars on a stereo system should certainly have Audio Notes $80,000 Ongaku integrated amplifier and $125,000 AN/E Sogon speaker on their must-audition lists. But Audio Note isnt just for the very wealthy, for this British brand also has a decidedly proletarian streak. As they say, you can have it in any color as long as it's black. Audio Note has one of the audio worlds more interesting corporate histories, but suffice it to say that during the mid-1990s, British Audio Note, under Peter Qvortrup, was engaged in the limited distribution of vacuum-tube amplifier kits. Among these was the celebrated Kit 1, a 300B-output, low-powered, single-ended-triode (SET) amp that was reputed to sound as beautiful as its chassis was ugly. Though the kits were neither marketed heavily nor particularly well known, they did find a worldwide following. 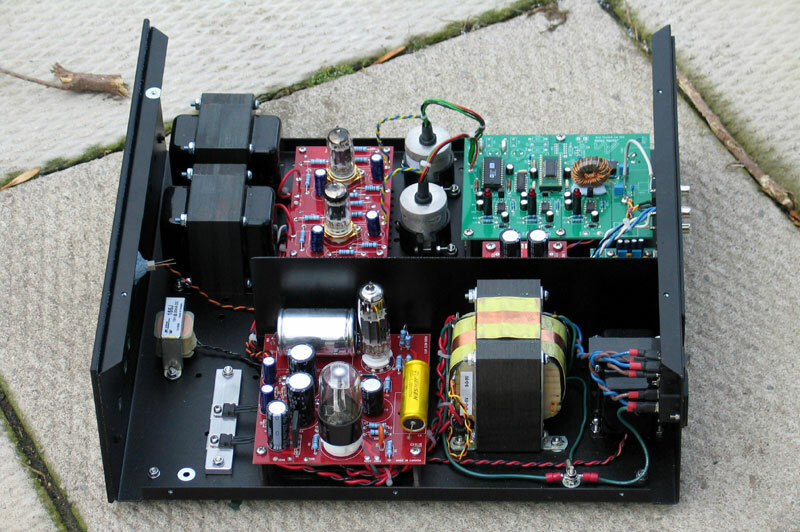 Among those who built a first-generation Kit 1 was Brian Smith (no relation), a Canadian with an obsession for 300B output tubes and a love for all things Audio Note. A family trip to the UK brought Smith to Audio Notes East Sussex factory in early 2002, and he was fortunate enough to be given a tour by none other than Peter Qvortrup. As they toured Audio Notes facility, Qvortrup shared his philosophy of music reproduction and some of his plans for the future. Among those was Audio Notes intention to get out of the kit business. With his factory barely able to meet demand for finished products, Qvortrup explained that he could no longer expend precious resources supporting kit builders. So the kits were history, unless, Qvortrup hinted, Smith would be interested in buying out the business. Within the space of a couple of months, pallets laden with heavy transformers, metal chassis and various and sundry parts were making their way across the Atlantic Ocean destined for Audio Note Kits in Ottawa, Ontario. After sorting thousands of parts into some semblance of order, Smith, a retired chip designer, set about building a website, establishing a forum on Audio Asylum and, perhaps most important, designing a new chassis for truly ugly Kit 1. Today, Audio Note Kits is a serious audiophile operation with a wide-ranging product line. From just an initial two kits on offer, Smith now markets seven amplifiers, three preamplifiers, three phono stages and four DACs. These kits are sold direct through Audio Note Kits, or by distributors in Britain, Norway and Hong Kong. Audio Note Kits also offers seven versions of the AN/E speaker kit, though these are not exclusive to Smiths business and can be purchased through any Audio Note dealer. My system has long included an Audio Note Kits DAC 2.1, or rather a variation of that kit. My 2.1 uses the original 12AU7/ECC82 output stage of the DAC Kit 1.1 but includes the M2 power supply of the 2.1 and many of the digital-board modifications used in the latter model. The subject under consideration here, the DAC Kit 2.1 Level C ($2499), bears only a passing resemblance to my DAC kit and to all those that came before it. Smith has leveraged his association with Audio Note by employing that companys chief designer, Andy Grove, to assist with the modernization of older kits and the clean-sheet development of new ones. The DAC Kit 2.1 Level C is the pinnacle of Groves Kits work and bears his signature from input to output. Keen-eyed observers will note that the digital-input board used on all Audio Note Kits DACs today bears a strong resemblance to the one used years ago in the original DAC Kit 1.1. In fact, the circuit board is identical; however, Grove has thoroughly altered the pathways from the DAC chips output onward. Smith contributed to the enhancement of the Level C digital board by substituting a hand-wound Audio Note digital-interface transformer for a mass-produced industrial part, replacing high-grade Beyschalag output resistors with top-line Audio Note tantalum parts and the upgrading of the digital boards capacitors to Black Gates PK series. Every Audio Note Kits DAC kit is shipped with an assembled and tested digital board. According to Smith, this makes the kit more accessible to builders at every level of experience and it ensures that every customer receives a tested and working digital board. Assembly of the remainder of the kit is up to the customer. Putting together the DAC Kit 2.1 Level C is made easy by the thoughtful segregation of parts into several transparent zip-close bags, each of which holds all the parts required to assemble a given module. With the DAC 2.1 Level C youll find three such bags: one each for the digital and analog power supplies, and another for the output stage. Also included in the heavy kit package are five transformers (one mains, two output and two interstage) as well as a power-supply choke. These come nestled in a large, high-quality satin-black powder-coated steel chassis. All the associated hardware to secure these transformers to the chassis is included with the kit. The DAC Kit 2.1s assembly manual is as thorough as can be imagined. Seventy-eight pages long and in its ninth revision, the manual includes dozens of photos and drawings that illustrate every step of the construction process in detail. Audio Note Kits also offers a DVD showing proper soldering technique and general kit-building tips for the true novice builder. The first task in building up the kit is to secure the audio-spec feet to the bottom of the chassis and bolt down the mains transformer and its choke. One thoughtful aspect of the new-and-improved DAC kits are unpainted pads located at one of the mounting holes for each transformer. These bare-metal pads make grounding the transformers to the chassis childs play. Well, actually, the old method was more like childs play: grab a flat headed screwdriver and scrape! Of course the kit will never work if it cant access mains power, so its also necessary to install the DACs power switch and 15-amp IEC inlet / fuse holder with the transformer and choke. Wiring these to the universal input voltage (100/120/220/230/240V) transformer is explained in great detail in the manual, which features easy-to-follow color diagrams describing exactly how the wiring must be connected for the voltage in your country. Once the power supplys mechanical assembly is complete, its time to warm up the soldering iron. One of the main differences between the old DAC 1.x series and the DAC 2.1 is the adoption in the newer model of Audio Notes M2 power supply for the analog output stage. This is taken wholesale from Audio Notes M2 preamp and is credited by those who upgraded their DAC 1.1 with this power supply (including yours truly) with offering a dramatic improvement in sound quality. The M2 supply is built up on a thick, heavy-gauge circuit board. 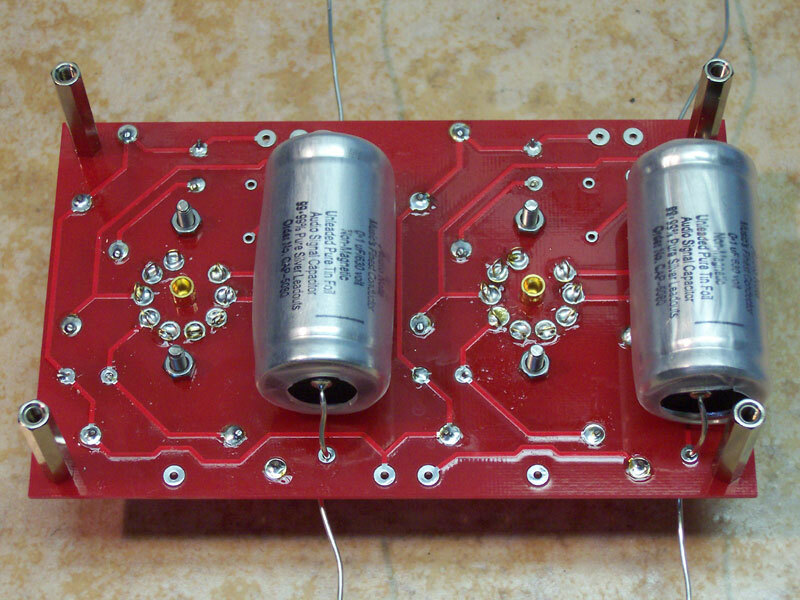 Assembly is quite easy, with the only tricky part being soldering the two vacuum-tube sockets to the board. The tube sockets are inserted through the top of the board and soldered from the underside, obviously with the circuit board upside-down. It is imperative at this stage that the builder not use too much solder on the socket pins. Gravity being what it is, excessive solder may run down into the sockets contacts, solidifying into a barrier that would make it impossible to insert a tube into the socket. Populating the M2 power supply with its electrolytic and film capacitors and resistors is straightforward and quickly accomplished. Note that the film coupling capacitors used on the power supply are very high-quality parts from Jensen and Audio Note. You dont see expensive parts like those in many $2500 products, especially in the power supply. Once the board is populated with resistors and capacitors its time to get down to some wiring. Finding the correct wire to hook up each tubes filament supply is a snap. Again, the well-organized bag system comes into play. The manual tells the builder to use the contents of Bag 3 to wire the power-supply board to the output side of the mains transformer, a task that is also explained (and photographed) in great detail in the assembly manual. Total time to bolt the transformer and choke to the chassis, install the IEC inlet, power switch and feet, and to build up and mount the M2 power supply was two and a half hours. The M2 power supply under test. Note the voltage regulators on the left affixed to an aluminum heatsink. 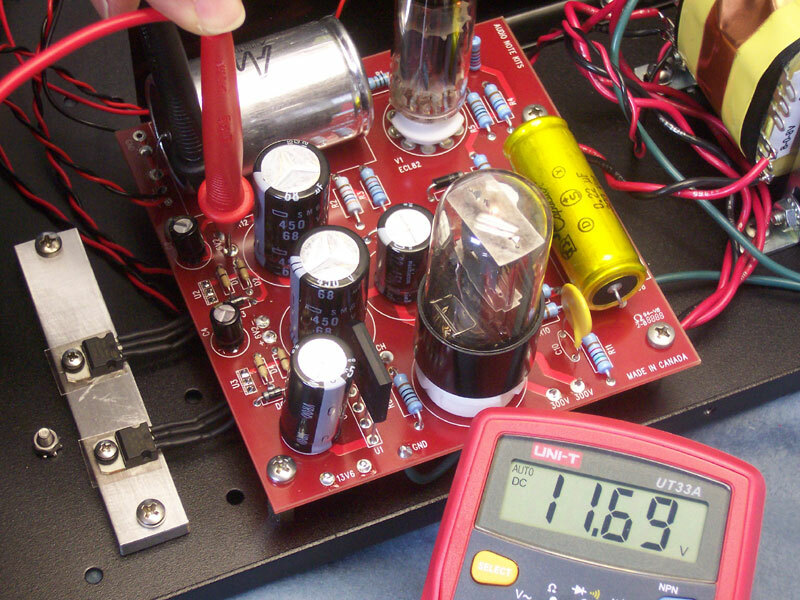 The DAC Kit 2.1 Level Cs M2 power supply is tested for correct voltage. Note the voltage regulators attached to the aluminum heat sink on the left, and the large Audio Note (silver colored) and Jensen (gold colored) film caps. The digital power supply is all new and was designed by Audio Notes Andy Grove. Assembly of this new digital supply is much quicker than the version it replaced and took only 15 minutes. A nice feature of this power supply is its small size: It takes up perhaps a quarter of the space the original digital power supply required, and it is powered by taps off the mains transformer used for the analog supply, rather than the dedicated, lower-quality transformer of old. After wiring the digital supply to the transformer's 9-0-9 volt taps. its time again to test your work. Now, 55 pages into the manual, its time to start building up the digital and analog assemblies -- the DACs music side, if you will. The first step here is the installation of the pre-assembled digital board. This involves attaching five aluminum stand-offs to the circuit board and fastening them to the chassis. The manual points out that one of the five posts is a grounding point that must be securely attached to the circuit board and to the chassis to prevent hum from entering the signal path. Once the digital board is in place, two analog output and a single digital input RCA jacks are installed on the chassis and the digital power supply is wired to the digital board. At section 9, page 58 of the manual, were finally ready to begin assembling the analog output board. Unlike previous DAC 2.1 versions, the new Level C kit uses an all-new 5687 tube-based output board. This is actually a gain stage taken directly from the Andy Grove-designed Audio Note Kits L3 preamplifier. For use in the Level C DAC, Grove also designed a pair of 33:1 step-down output transformers to bring the output voltage down to normal levels. But lets not get ahead of ourselves. The 5687 board is a breeze to assemble and is a neat and tidy design. One thoughtful aspect of the design is the placement of the Audio Note aluminum-foil output coupling capacitors underneath the board. This allows better spacing of the components on the top side of the board, which prevents them from electrically interfering with one another. Audio Note aluminum-foil capacitors reside underneath the output stage and can be upgraded to copper or silver foil at greater and much greater cost respectively. Even modern fast op-amps will slew limit internally and that affects sound quality. Some engineers have found that using extremely fast op-amps improves the sound quality, but we have completely sidestepped the issue by using a transformer I/V system. The transformer not only provides an I to V function but the way it is used in our latest DACs transfers maximum energy from the DAC chip itself. Wiring the color-coded I/V transformers leads to their respective homes on the digital and analog boards is straightforward. The wires are about five times longer than necessary though, so some trimming is required. The final major assembly stage is bolting in the I/E core output transformers and wiring them between the 5687 output stage and the DACs analog output RCAs. As mentioned, the 5687 stage is a high-output design, so the transformers are in place to trim their output to a level that can be tolerated by any downstream audio component. Smith says that the output transformers have very low impedance and are compatible with any preamplifier. At this stage all that remains to be done to complete the Level C kit is to attach the front and rear trim plates, wire the included coaxial digital cable from the input RCA to the digital board, and connect the output transformers to the RCA output jacks. If a customer ops for a multi-input DAC, which can include an optional USB or AES/EBU (XLR) connector, the manual details how to install a selector switch to toggle between inputs, as well as where and how to connect additional inputs to the digital board. The review sample included a pre-assembled Hagerman Technology USB-to-S/PDIF converter board that installed in a jiffy. Total assembly time for the DAC 2.1 Level C was about eight hours, which would probably translate into two or three evenings for most builders. 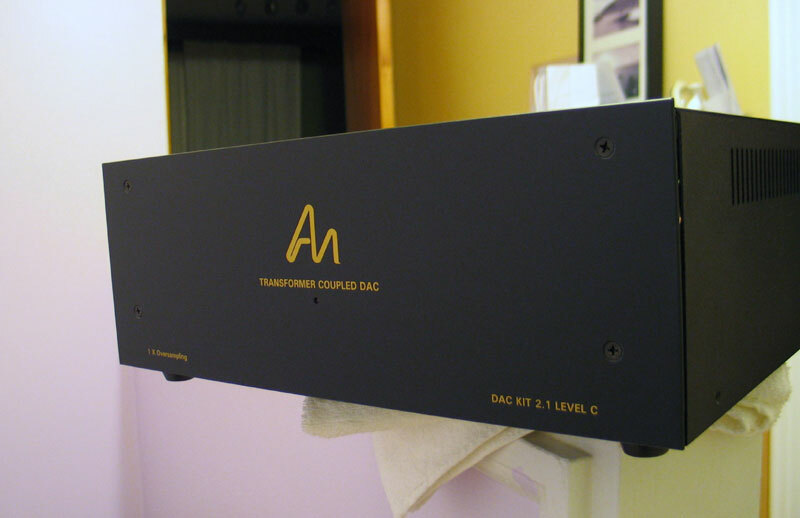 With the DAC Kit 2.1 Level C assembled and tested, the extensive break-in period began. The Black Gate capacitors on the digital board are notorious for requiring a long break-in period, and they certainly lived up to reputation in this case. However, after about 300 hours of constant use, the Level C was finally ready to go. Integrated Amplifiers  Audio Note Kit 2 (from kit), Blue Circle Audio CS, Simaudio i5.3, DIY Paradise Charlize 2, Marantz SR8400 receiver. Digital source  Dell laptop running Exact Audio Copy and Foobar2000 (FLAC format), Hagerman Technology HagUSB USB-to-S/PDIF converter (from kit). Speaker cable  Furutech u-2T. Digital cable  Furutech FX-Alpha-Ag. Power cords  Furutech FP-314-Ag. Accessories  Soundcare Soundspike footers, Vibrapods. The DAC Kit 2.1 Level C is smooth, natural and, generally speaking, neutral. The Level C has lots of drive and packs a terrific bass wallop without sounding tubby. I really enjoyed listening to acoustic bass through the Level C. Ray Browns "Bass Face," from Bassface: Live At Kuumbwa (Telarc CD-83340), was an especially enthralling listen, as the Level C captured the subtlety and power of the masters playing in fine detail. Quieter details like offstage crowd noises were much more clear than through my old DAC Kit 2.1. In the middle range, the Level C is warm, as would be expected of a tube-based product, but it doesnt push the midrange way out in front of the rest of the music. Instead, the Level C makes vocalists sound a little more human and acoustic instruments a little more natural, with neither being given any more prominence than the recording engineer intended. Jethro Tulls Irish-folksy "The Whistler" from Songs from the Wood (Chrysalis 81570), for example, offers a well-recorded interplay between Ian Anderson on acoustic guitar and Ian Anderson on the flute. The Level C faithfully captured the essence of these instruments, those resonances and tones that tell your ears that youre hearing natural materials in all their glory. The DAC Kit 2.1 Level C isnt the last word in recovering the fullness of attack and decay on piano, drums and cymbals or stringed instruments. The Level C is remarkably quiet in operation, and it was only when I cranked my Simaudio i5.3 to maximum volume that I could hear the slightest tube rush and hum, and even then only when sitting right in front of the PSB Synchrony Bs. That said, music through the Level C doesnt emerge from as inky black a background as it does from Benchmarks DAC1 Pre ($1595). Detail retrieval is quite good, but is not as sharp as with the Benchmark. It was fascinating for me to compare the now out-of-date DAC Kit 2.1 and the new Level C variant. The Level C is more detailed, has more drive, is more refined, offers a much better sense of air around instruments and singers, and is closer to neutral than its predecessor. In short, the DAC 2.1 Level C is really a whole other animal. Any resemblance to the previous generation of Audio Note Kits DACs is by and large cosmetic. In the end, is the DAC Kit 2.1 Level C worth the effort and expense? In a word, yes! For such a high-grade kit, the Level C is very easy to build and is well within the reach of the novice builder. Im pretty confident in saying that you wont find another DAC in the Level Cs price range that comes close to matching it in parts quality, or one that was engineered by someone who designs five and six-figure components in his day job. Twenty-five hundred dollars may seem a lot for a kit, but just imagine what the DAC Kit 2.1 Level C would cost as a finished product.